Ramps are well-known in the Appalachians as a sign of spring. 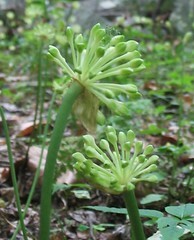 When their broad green leaves emerge in April, there are ramp festivals throughout the region, as people cook up the roots and leaves. A member of the genus Allium, ramps are closely related to garlic and onions -- and are often called wild leeks. Because of their strong odor, Ramps were called pikwute sikakushia (the skunk) in the language of the midwestern Menomini Indians. Rich woodlands near the southern end of Lake Michigan were said to be a favorite Ramp gathering area, for which reason they called this area shikako, (the skunk place). This is where the fuming, seething, metropolis, now known as Chicago, gets its name. Skunky or no, many wild food enthusiasts say ramps are tastier than any cultivated allium. In the wild: Ramps are associated with the mountains, but they do grow in the wild along the Potomac -- perhaps the seeds have washed downstream. 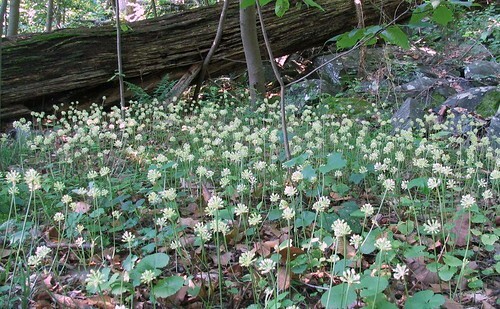 They grow in profusion at Scott's Run. We also have seen them on an island off the C&O Canal. In your yard: You'll want a shady spot with rich soil. I'm not aware of nurseries that sell them, but you could try collecting seed in the fall and see if you can get them to come up. They will need to be in the cold outdoors over the winter, just like they would be in the wild. And some may take more than a year before they germinate. But it's worth a try!